Prints up to 25 pages per minute in color and black. Perfect for line drawings, renderings and presentations. Robust yet compact wireless printer includes built-in scanner with up to 600 dpi. The intuitive touchscreen works like a smartphone. Uses individual inks so you only need to replace the cartridge that runs out. With HP e print, you can print from your tablet, smartphone or interconnected PC. Produces prints 3 times faster than previous HP models. Choose from 40ml to 300ml HP ink cartridges to fit your print volume. Optimized print resolution up to 2400 x 1200 dpi. Copy reduction/enlargement ranges from 25% to 400%. Makes up to 99 copies. Measures: 45.5"H x 55.2"W x 24.8"D.
36"; A3; 8.27" x 10.98"; 12.99" x 18.98"; 35.98" x 74.69"
Immediately update all your partners on project review results with the most compact large-format MFP.1 Intuitive, convenient print/scan/copy and HP DesignJet print quality help you communicate effectively and move the project forward. Enhance communication with peers/partners. With an intuitive single touchscreen, you can scan, copy, and share drawings immediately. Scan/email from the front panel. Use HP Smart app4 to email contacts or post to cloud from your smartphone, tablet. 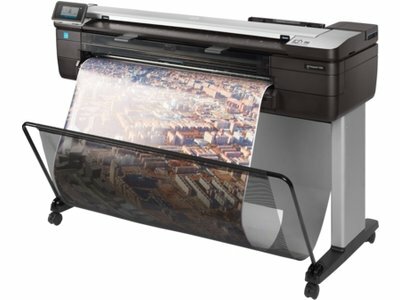 2 Local printing requires mobile device and printer to be on the same network (usually Wi-Fi access points bridge wireless to wired connections) or have a direct wireless connection. Wireless performance is dependent on physical environment and distance from access point. Wireless operations are compatible with 2.4 GHz operations only. Remote printing requires an Internet connection to an HP web-connected printer. Wireless broadband use requires separately purchased service contract for mobile devices. Check with service provider for coverage and availability in your area. See http//www.hp.com/go/designjetmobility for more details. 3 ±0.1% of the specified vector length or ±0.2 mm (whichever greater) at 23° C (73° F), 50-60% relative humidity, on A1/D HP printing material in Best mode with HP Heavyweight Coated roll feed and Original HP Bright Office Inks.